Google has updated its platform distribution numbers today, showing a nice increase for Android 6.0, but Lollipop is still ticking upward too. 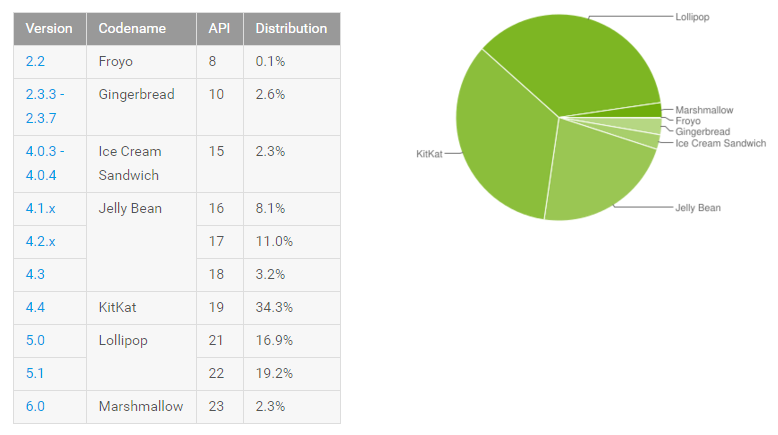 As for our Froyo deathwatch, the watch continues as Android 2.2 is holding on at 0.1%. This is by far the largest bump in usage Marshmallow has seen since its release. It almost doubled since last month as several popular phones started getting their 6.0 updates. Android 5.1 continues to grow as budget phones are updated, but 5.0 variants have actually gone down 0.1% this month. KitKat lost 1.2% this time, the largest of any single version. It does have a lot farther to fall, though. Even now it makes up more than a third of all Android devices. All the older versions of Android are down by less than 1%. Froyo could die any day now, but then we'll have the Gingerbread deathwatch, then the ICS deathwatch, and so on.